The incredible, comfortable, supportive flexible cushion. Supports so well, you can sit on an egg without breaking it! Say goodbye to sore, stiff muscles caused by sitting all day or long car rides. Sitting for long periods puts pressure on your tailbone and hips. Alleviate your achy spine and backside on the Egg Sitter. 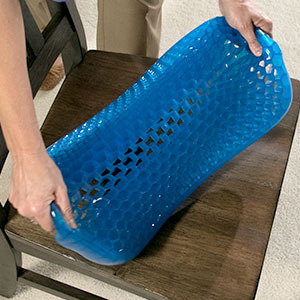 Egg Sitter cushion for tailbone pain jumps ahead of the curve with its unique flex-grip honeycomb design. When you sit on Egg Sitter, it collapses in on itself to provide you with optimal lumbar support and comfort. Made with ultra-flex polymer, Egg Sitter cradles your tailbone. 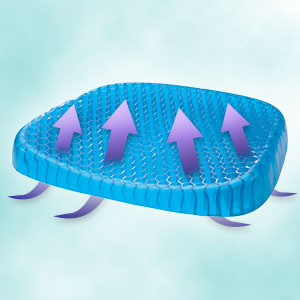 The honeycomb grid allows air to circulate through the cushion so it stays cool to the touch. Egg Sitter support cushion is durable for everyday use. It retains its shape even if you sit on it every day all day long! Whether you need support in your computer chair, office chair, deep seat, car seat, or recliner, Egg Sitter can help! So flexible you could sit on an egg and it won't break!